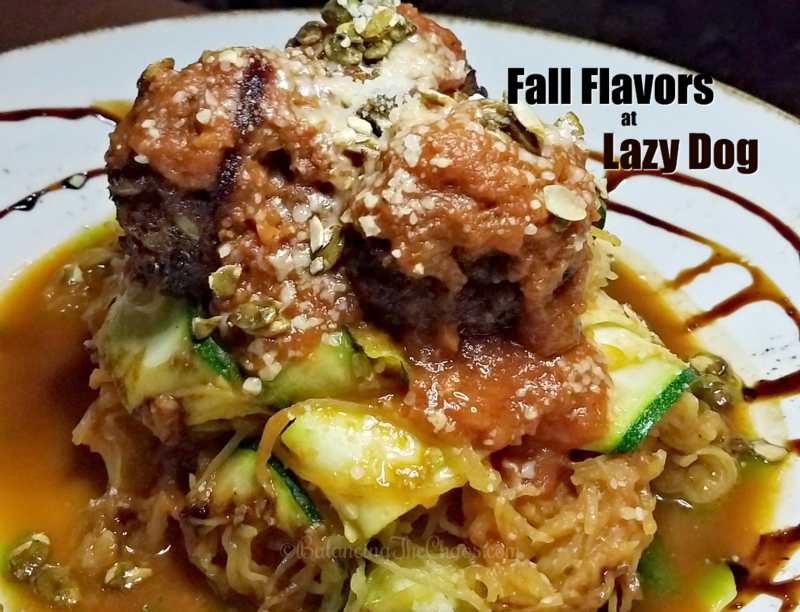 With the coming of Fall, Lazy Dog Restaurants & Bar recently rolled out their seasonal inspired menu featuring scratch made dishes in a fun, relaxing environment. 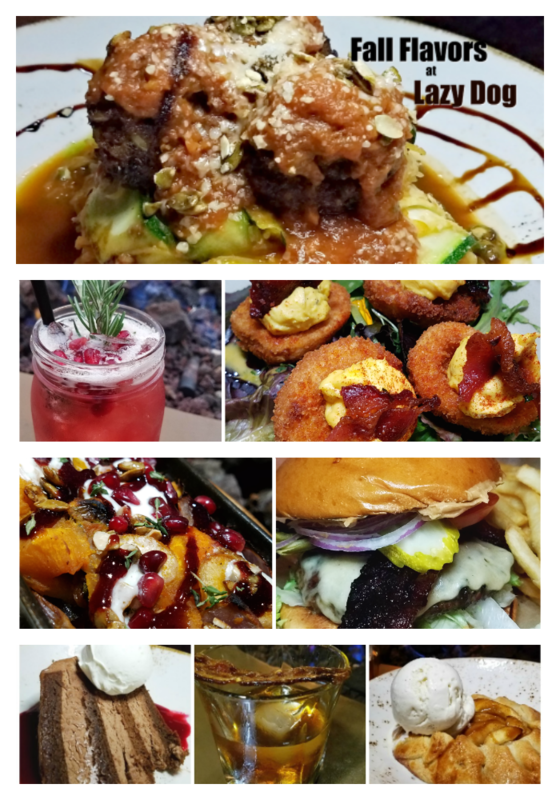 Enjoy the flavors of fall with a Maple Bacon Old Fashioned cocktail, Roasted Winter Veggies, a PB & J Burger, Spaghetti Squash and Beetballs, Bone-in Apple-Sage Pork Chops and couple of fabulous desserts. You can pick up a quick dinner or sit, mingle and catch up with friends. Even furry family members are also invited to enjoy a night on the town with their families. 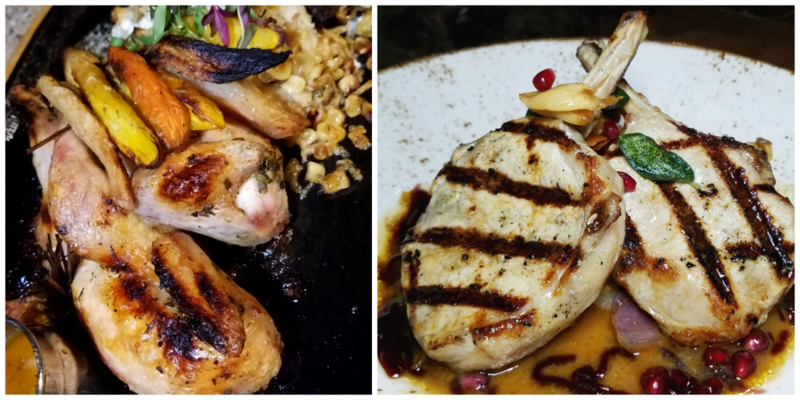 I was recently invited to a media sampling of the Fall dishes currently offered at our local Lazy Dog in Huntington Beach. We started off with the Pomegranate Punch and the Crispy Deviled Eggs. I loved the Pomegranate Punch as it was very light and refreshing. 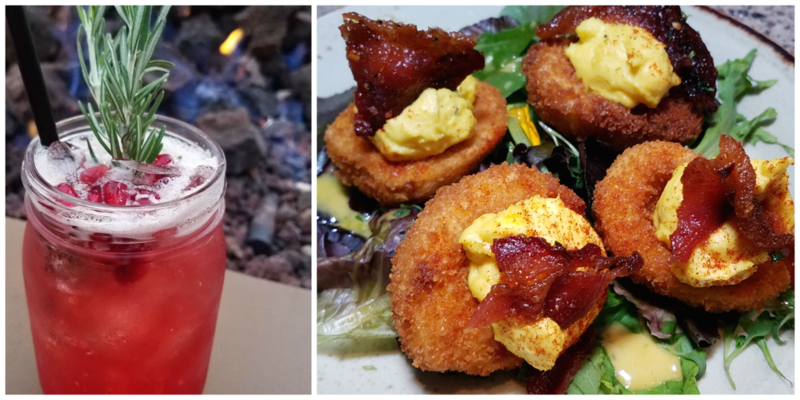 The Crispy Deviled Eggs are lightly fried and topped with smoked paprika and bacon candy. It was so tasty. 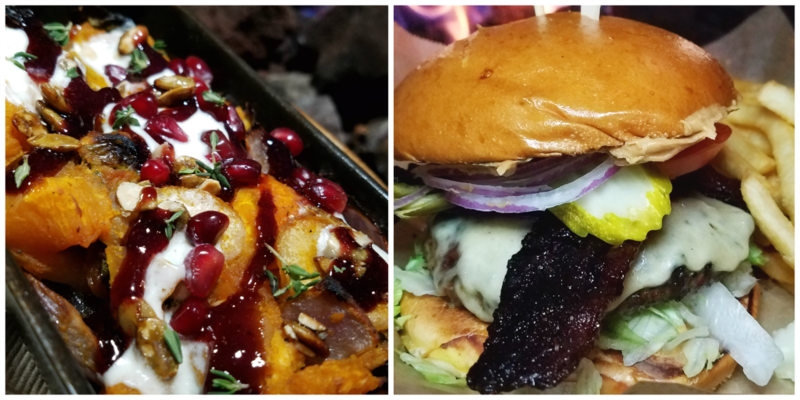 We also sampled Roasted Winter Veggies and the PB & J Burger. The Roasted Winter Veggies consisted of brussels sprouts, carrots, sweet potatoes, red onions topped with creamy mozzarella burrata and candied pumpkin seeds, pomegranate and thyme. It was so good, I could have made a meal out of the veggies. The PB & J Burger was surprisingly delicious. Not a combination I would typically choose, the peanut butter gave the burger a hint of the salty paired with the jam for the sweet. Marry that with candied bacon, Havarti, lettuce, tomato, onion and a pickle and you have a delicious burger. My favorite dish of the evening was the Spaghetti Squash and Beetballs. Pictured above, this dish is a great vegetarian option. Spaghetti squash and zucchini ribbons topped with olive oil, garlic, marinara sauce with vegetarian meatballs that have small bits of beets. The dish is finished with Romano cheese, pesto, toasted pumpkin seeds and a balsamic reduction. I was impressed at the size of the dish as well, as I could save half for dinner and take half home. For meat eaters, the Cornish Game Hen or the Bone-in Apple-Sage Pork Chops are great options. The oven roasted Cornish game hen is cooked to perfection with carrots, feta, sausage, sweet corn stuffing and a side of sweet apple-sage gravy that is a must with the game hen. The pork chops were also amazing. They are marinated for 24 hours, grilled and served with roasted winter vegetables and gravy. To end the evening, we enjoyed the Seven-Layer Chocolate Cake that is gluten sensitive, a strong Maple Bacon Old Fashioned and my favorite, the Apple Huckleberry Open Faced Pie. 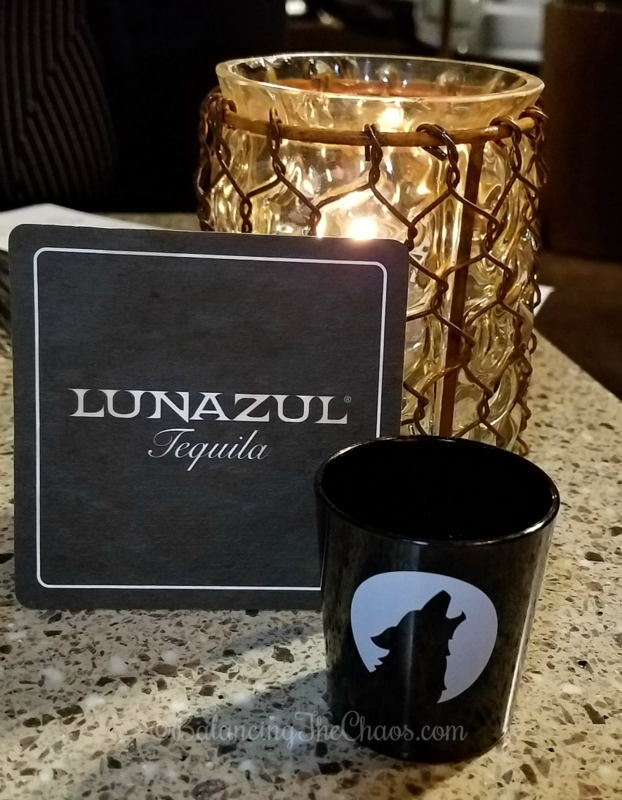 During the evening we also had the opportunity to sample a Meyer Lemon Margarita, that was quite tasty with a Lunazul Tequila. 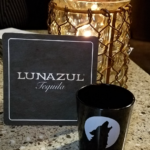 A family owned business, the blue label Lunazul Tequila was really good. Visit your local Lazy Dog to try out the new seasonal items before they’re gone.